If you’re looking for physical security solutions in the Los Angeles area, we’re here to help. We serve the Greater Los Angeles Area as well as San Bernardino County and the surrounding region from our convenient location in Colton, California. The Colton Crossing might be gone, but we haven’t gone anywhere! We’re always here to help you with your security needs. We’re about 60 miles west of Los Angeles, right near the Riverside Freeway. After you visit us in Colton, feel free to stop by the San Bernardino National Forest and check out some amazing nature. San Bernardino is one of the most populated counties in California and in the United States. We know just how important physical security is and always work with our customers to ensure that their businesses have the protection that they need. If you have any questions about business security solutions, just give us a call. Not in the Los Angeles area? Give us a call today for a consultation on how we can best serve your area. Stay on top of your security by subscribing and we'll send you our tips and helpful insights right to your inbox. 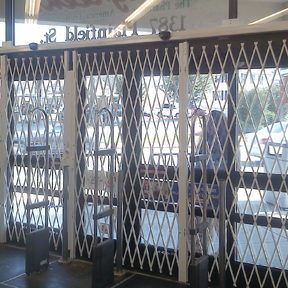 Quantum is a major supplier and distributor of folding retractable security gates across the United States, Canada, Mexico and the Caribbean. Established in 1997, the Quantum team takes a technical, solution-oriented approach to addressing the unique needs of each of our customers. Which gate is right for you?